Spacious and comfortable villa with fantastic facilities. Just a short walk from a small beach. Great indoor heated pool, hot tub, sauna, table tennis table and pool table. Enclosed garden. This 4 bedroom house is located in Plouescat and sleeps 8 people. This villa has been equipped with a very large pool that can be heated. The extraordinary house in Neobretonic style therefore is qualified to offer you holidays the whole year round. This 3 bedroom house with private pool is located in Arzon and sleeps 8 people. It has WiFi and garage. The house is near a beach. This 2 bedroom house is located in Trégunc and sleeps 5 people. It has WiFi, a garden and barbeque facilities. The house is within walking distance of a beach. This 3 bedroom house with private pool is located in Plouha and sleeps 8 people. It has WiFi. The house is within walking distance of a beach. South-facing family beach holiday villa. Very close to the sea, all mod cons including indoor heated pool, hot tub, sauna, games room. Short drive from all amenities and water sports activities. Perched on the edge of a small village between the coastal areas of Côte d'Emeraude and Côte Penthièvre with its beautiful beaches. Incredible former sea captains’ house with direct access to a sandy beach, panoramic sea views and within walking distance of the small seaside resort of Locquirec. This 4 bedroom house with private pool is located in La Trinité-sur-Mer and sleeps 8 people. It has WiFi, a garden and barbeque facilities. The house is near a beach. This 7 bedroom house with swimming pool is located in Landéda and sleeps 12 people. It has WiFi. The house is near a beach. This 3 bedroom apartment with swimming pool is located in Quimper and sleeps 6 people. It has WiFi. The apartment is near a beach. This 2 bedroom house is located in Pleubian and sleeps 4 people. It has a garden, barbeque facilities and garage. The house is within walking distance of a beach. This 2 bedroom apartment is located in Saint-Servan Ouest and sleeps 4 people. It has WiFi. The apartment is within walking distance of a beach. Contemporary, well-equipped beach villa. Indoor heated pool, hot tub, sauna , games room. South facing. Enclosed garden. 600m from a beach. Great location to explore the coastline and pretty harbours. Nestled amidst extensive lawned grounds, adorned by flowers and with a rich backdrop of trees, this four bedroom holiday home - named Villa Lea - is a great choice for a relaxing holiday in Brittany. 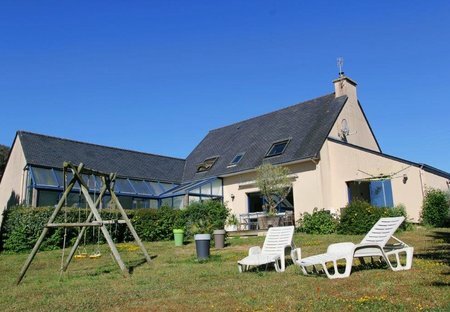 This 5 bedroom house with private pool is located in Plougonven and sleeps 10 people. It has WiFi. The house is near a beach.